Escritura en tránsito / Writing in Transit is a project aimed, primarily, at the Spanish-speaking community who commutes thorough St. George Ferry Station in Staten Island. The project also has a bilingual component, so that all people passing thorough the station could be invited to read and write. This is the first time I organized a workshop in a transit area. From experience, I know that movement is not necessarily at odds with concentration. On the contrary, it can feed writing. St. George Ferry Station is a wide space with high foot traffic, through which commuters and tourists transit regularly. I believe this station is spacious enough to accommodate, during off-peak hours, a table and some chairs, the only elements needed to come together to write. 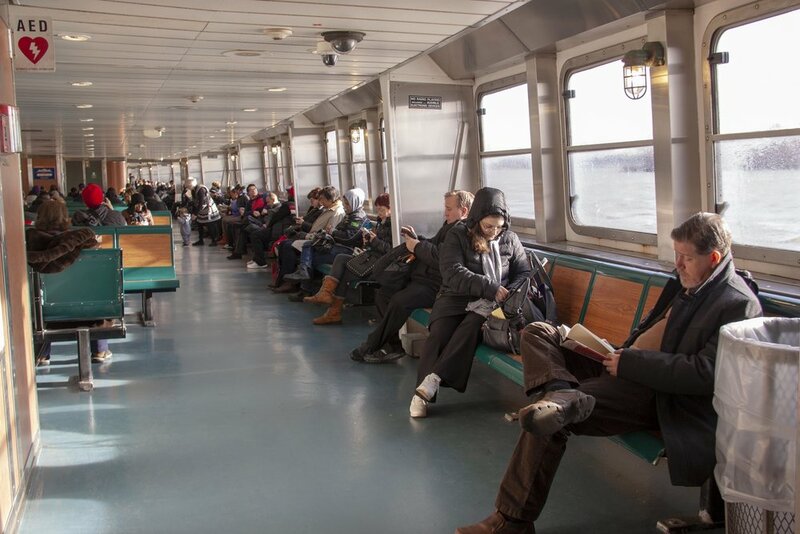 In turn, the ferry ride offers 25 minutes of pleasant transit for reading, observing, thinking, and writing. 1) An 8 week-long workshop: We read a poem or short story by a Hispanic-American writer and I give a writing proposal related to personal experience and daily life, as well as sensory perceptions and the experience of being in transit. Participants write during the workshop, and we comment on everyone’s texts. 2) In transit: The poem (or story) and the writing proposal was printed on paper, so passers-by are able to take a copy with them, and it was written on a banner so people could take a photo while in transit, and they can read and write during the ferry ride, on the commute, or at their homes. Although the workshop is primarily geared to Spanish speakers, these printed materials are bilingual, so that all passers-by could engage in some of the activities. All the texts received are distributed every week through a blog and social networks. A selection of the texts were translated and published in Spanish and English for free distribution to ferry commuters. Claudia Prado was born in Puerto Madryn, Argentina. She is the author of three books of poetry: “El interior de la ballena” (Nusud, 2000), “Aprendemos de los padres” (Rijksakademie van Beeldende Kunsten, 2002) and “Viajar de noche” (Limón, 2007). 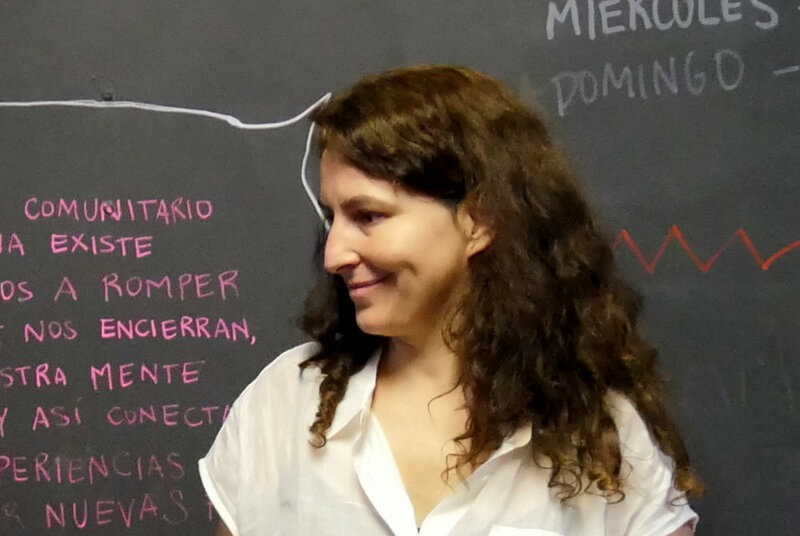 She co-directed the documentaries “Oro nestas piedras,” about the poet Jorge Leonidas Escudero, and “El jardín secreto”, about the poet Diana Bellessi. In 2011, she was the recipient of a Fondo Nacional de las Artes grant, and in 2015, a Queens Council on the Arts grant. From 2006 to 2011, she was one of the teachers in the poetry workshop “Yo no fui” at a women’s penitentiary in Ezeiza, Argentina. Since 2003, she has run poetry and prose workshops for adults and adolescents. She now lives in Jersey City and organizes creative writing workshops in New York and New Jersey, working independently and also with some organizations (Hour Working Women Re-Entry Program, Word Up Community Bookshop, National Domestic Workers Alliance, Project Luz, La colmena, among others), some of them with the support of Poets & Writers.